cumulonimbus - a dense towering vertical cloud associated with thunderstorms and atmospheric instability. They may produce lightning and other dangerous severe weather, such as gusts and hail. 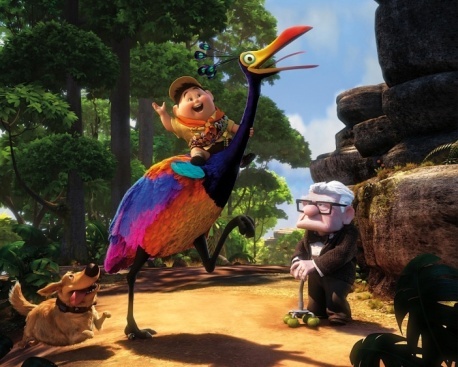 Kevin the bird is just this fantastical creature that seems to be the prefect kind of foil for Carl to complete his journey. Get out of here! Ah! Go! Because of Kevin, they stumble into this big entry. The film goes off in weird directions featuring things you’ve never really seen before. Complete the sentences below with the words/ phrases provided in the box. A phrasal verb is a verb plus a preposition and/or an adverb which creates a meaning different from the original verb. For example in the video, go on means to happen, while come along means to go somewhere with someone. Phrasal verbs are very common in spoken and written English, so you need them to understand natural English and to sound more natural when speaking English. Complete the tasks below to learn more about some common phrasal verbs that begin with go or come. Match the phrasal verbs with their definitions. Please note that some of the phrasal verbs may have more meanings than the one given in this exercise. Consult a dictionary when necessary. Complete the following sentences by selecting the appropriate phrasal verbs which fit the sentence contexts.